Posted: Thursday, November 17, 2016. 8:56 am CST. Posted: Thursday, November 17, 2016. 8:55 a.m. CST. By BBN Staff: This week, Minister of Defense John Saldivar is visiting BDF installations in the West as part of his countrywide tour. Yesterday Saldivar was accompanied by BDF Deputy Commander Colonel Steven Ortega and personnel from the Ministry of Defense. 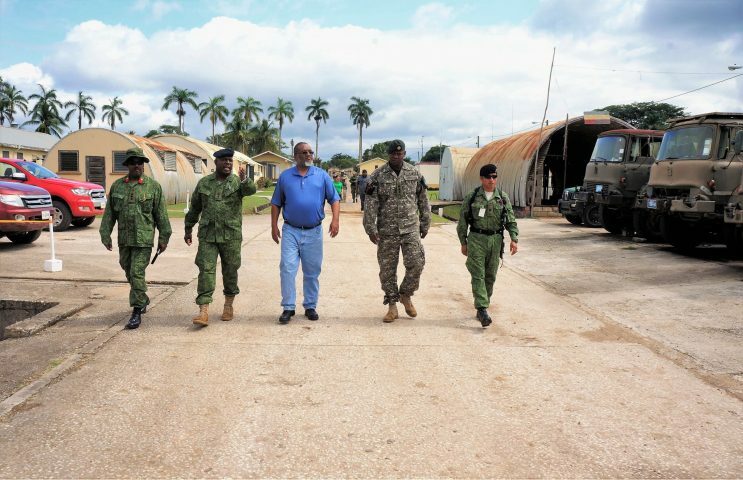 They visited Camp Belizario in the Central Farm area of the Cayo District where he was briefed on security functions and given a full tour of the facilities. The Minister was also briefed on international military training being carried out under Exercise Tropical Dagger 16 which includes security forces from Jamaica, Canada, United States and Belize, and is being conducted in Belize for the first time. Saldivar and his team were then taken on a fly over along the Belize- Guatemalan border where BDF personnel man a number of posts, such as Xunantunich, Arenal and El Pilar located in the Bullet Tree area. Returning to the ground, Saldivar was then given a full tour of those posts. He continues his tour in the West today and tomorrow. This countrywide tour will take him next to the southern part of the Country. The purpose of the countrywide tour is to assess the state of readiness and the level of efficiency of the force in executing its various functions.